The Layered Chicken Dinner from the new Everyday Cooking for Thermomix Families TM5 is a winner! I had been wanting to make it since I first saw the new cookbook but with a total cooking time of 1 hour and 45 minutes I had to plan ahead. There isn’t too much prep work to do and you don’t have to wash the bowl after making the chicken rub. I think haven those flavours in the soup really added to the amazing flavour. I didn’t have enough pumpkin so I add 300g of sweet potato and maybe that also really added to the flavour. While the soup was cooking the chicken was steaming in the Varoma. This took 55 minutes which was plenty of time for me to get my home workout done! Then it was time to add the carrots and potato around the chicken and steam for 15 minutes. That was enough time for me to have my shower. 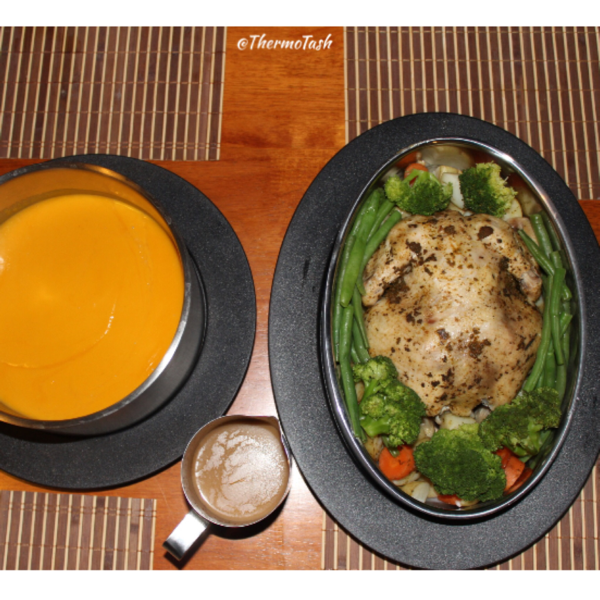 The chicken was cooked by now and it was time to blend the soup before making the gravy. This was actually my first time making gravy and it was divine. It did have 2 teaspoons of chicken stock paste in it which added a lot more flavour. And while the gravy was cooking the broccoli and green beans were steaming in the Varoma. I just love layered cooking! 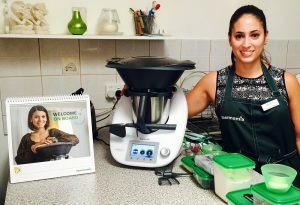 So while this meal has a long total cook time I can guarantee it is definitely worth it and I think it just might be my new favourite Thermomix recipe!